John Herschel was a polymath – a brilliant mathematician, astronomer, chemist, and inventor. He produced the first global survey of the night skies, discovered hundreds of nebulae and thousands of double stars, invented the actinometer to measure the heating power of radiation, invented hypo fixing of photographs, and invented the cyanotype, which allowed blueprints to be made. He took the first ever photograph on glass plate – shown above. Built the first telescopic observatory in the Southern Hemisphere and produced a comprehensive catalogue of the Southern Hemisphere’s skies. Added his southern sky survey to his earlier northern sky survey to produce a complete survey of the heavens. Discovered over three thousand double stars and 500 nebulae. Invented the actinometer to measure the heating power of radiation, such as the energy received on the earth from the sun. Named seven moons of Saturn and four moons of Uranus. At the dawn of photography, invented hypo solution to fix photographs. Coined the word photography, popularizing it in the English speaking world. He was also the first to describe photographs as either negatives or positives. Invented the cyanotype, a photographic printing process that later allowed engineers and architects to produce blueprints of their designs. 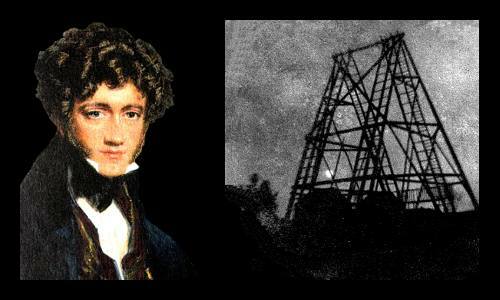 John Frederick William Herschel was born on March 7, 1792 in the town of Slough, England, UK. John was an only child, born to a father and mother who were 55 and 42 years old respectively. His father was the great astronomer William Herschel, telescope builder, discoverer of Uranus, and discoverer of infrared radiation. His mother was Mary Pitt, daughter of a wealthy businessman. Even as a child, John helped his father and his father’s sister Caroline Herschel, also a talented astronomer, with their work. At age eight, John was sent to Britain’s most prestigious private school, Eton College, but was withdrawn after he was bullied. He was then educated in local schools and by a private mathematics tutor. John Herschel studied Mathematics at the University of Cambridge, graduating with first class honors as the top student (Senior Wrangler) in 1813, age 21. Upon graduation, he was elected a fellow of St John’s College, Cambridge, and published several notable papers in mathematics journals. At Cambridge he became friends with Charles Babbage, who would later invent the programmable general-purpose computer. Herschel, Babbage, and their friend George Peacock formed The Analytical Society, which successfully advocated that Leibniz’s differential calculus notation be used in preference to Newton’s notation in the United Kingdom. In 1814, Herschel started training in London to become a lawyer, but changed his mind the following year and returned to life as a mathematician at Cambridge. In 1816, he decided to follow in his 77-year-old father’s footsteps. He refurbished his father’s favorite telescope, a 18-inch (460 mm) reflecting telescope with 20-foot (6.1 m) focal length. In 1820, age 28, Herschel helped found the Royal Astronomical Society and was elected its vice-president. In 1824, he produced a catalogue of double stars. He carried out this work to further his father’s attempts to measure the parallax of a star in order to deduce its distance from Earth. Although he published important contributions in this field, it was not until 1838 that Friedrich Bessel made the first determination of the distance to a star. In the second century BC, a genius by the name of Hipparchus measured how far the moon is from the earth using parallax. When you view something from a different location, it appears at a different place against the background. In the example above, the different locations are your left eye versus your right eye. The moon shows a significant amount of parallax when viewed from Greece versus Egypt, which allowed Hipparchus to make an excellent estimate of its distance. It took until 1838 for any star’s distance from the earth to be measured, when Friedrich Bessel determined the distance to 61 Cygni. In 1825, Herschel invented the actinometer to measure the heating power of radiation, such as the energy received on the earth from the sun. The instrument was vital in the development of the science of photochemistry. In 1827, he was elected President of the Royal Astronomical Society. In 1830, he said it was possible that our planet’s climate could be influenced by changes in the eccentricity of its orbit around the sun. He concluded the effect would be minimal. His suggestion was later taken up by James Croll, who believed the effect could explain the ice ages. From the late 1820s until 1833, Herschel continued studying double stars, determining the orbits of those sharing a common center of gravity. While carrying out the work, he discovered over 3,000 double stars. In 1832, he published a star catalogue containing over 2,000 nebulae, of which over 500 were his own discoveries. Between 1834 and 1838, Herschel lived in South Africa, where he established the first telescopic observatory in the Southern Hemisphere. He made a complete telescopic survey of that hemisphere’s heavens. This allowed him to complete a total survey of the earth’s skies he began in the United Kingdom in 1825. In 1835, he observed the return of Halley’s Comet, making careful observations of its highly elliptical orbit around the sun. These observations allowed him to determine that a force was acting on the comet, repelling it from the sun. This was the first indication of what would later be called the solar wind. Herschel also discovered that gas was evaporating from the comet. In 1839, Herschel made a huge step forward in the science of photography. Louis Daguerre had discovered that images could be captured by focusing light on silver halides. Herschel discovered that the images could be made permanent and completely resistant to further reaction with light by reacting the silver halides with sodium thiosulfate (hyposulphite of soda). ‘Hypo’ solutions became the means by which photographs were made permanent. On September 9, 1839 John Herschel took the first ever photo captured on glass plate. 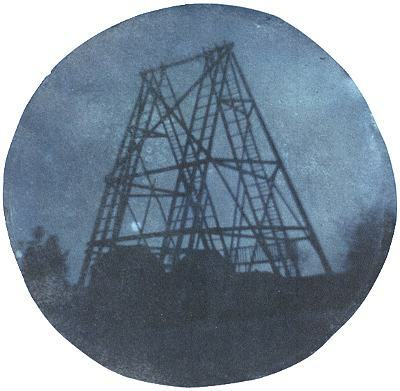 The photo shows the structure that supported his father’s 40-foot telescope in Slough. Herschel coined the word photography and was the first to describe photographs as either negatives or positives. In 1842, Herschel invented the cyanotype – the low cost photographic printing process that allowed engineers and architects to produce blueprints of their designs. Herschel found that iron salts were light sensitive. He coated paper with a solution of iron salt and dried it in darkness. The object or image to be copied was placed on the coated paper in bright sunlight for 15 minutes producing a white image on blue background. On March 3, 1829, Herschel, age 36, married his cousin Margaret Brodie Stewart in Edinburgh. The couple had 12 children, three of whom: William, Alexander, and John Jr. made significant contributions to science. Sir John Herschel died, age 79, on May 11, 1871 at his home near Hawkhurst in Kent. He was buried with full honors in the Nave of Westminster Abbey, near the graves of Isaac Newton and Charles Lyell. Eleven years later, Charles Darwin was buried next to John Herschel. "John Herschel." Famous Scientists. famousscientists.org. 31 Mar. 2018. Web.